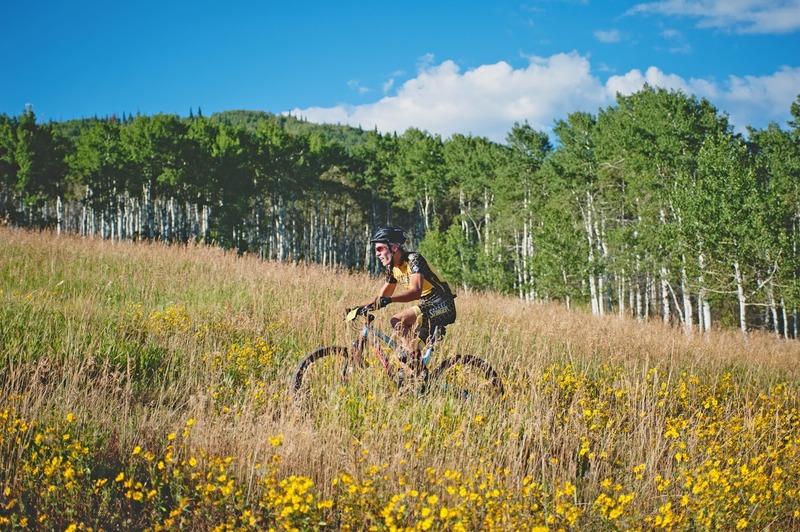 Honey Stinger hosted its popular mountain-bike and running event, the Steamboat Stinger, this past weekend. The event was the largest Stinger to date, drawing more than 900 competitors, with the mountain-bike race component reaching its maximum amount of 600 spaces back in late May. The 50-mile mountain-bike race took place on Saturday, covering singletrack on Steamboat’s Emerald Mountain two 25-mile laps starting near the base of Howelsen Hill and ending via Lupine and Bluff’s Loop. Riders in Saturday’s race could opt to ride the course solo or in a duo team with riders alternating laps. Sunday’s running competitors raced either a marathon, covering the same trail as one lap of the mountain bike race, or a half marathon, covering a portion of the trail. Back for his third win, Russell Finsterwald of Colorado Springs finished nearly six minutes ahead of the pro/open men’s field in 4:04:22, with Kerry Werner in second and Chris Baddick in third. Park City native Emma Garrand, won the pro/open women’s division with a time of 5:07:38, ahead of second place finisher, Jari Kirkland, and third place finisher, Jennifer Moos. In the citizen division, Robert Umland finished first among men while Megan Short won the women’s race. In the duo divisions, Ian Anderson and Spencer Powlinson took first for the men, while JB Brockman and Maura McGovern won for the women. Brad Bingham and Hannah Williams led the coed duo division. Andrew Biglow of Littleton took first in Sunday’s trail marathon, finishing in 3:19:21, while James Johnson finished first for the fifth consecutive year in Sunday’s half marathon with a time of 1:33:21. Reese Ruland of Fort Collins won the women’s trail marathon with a time of 4:15:24, while Whitney Barrett led the women in Sunday’s half marathon with a time of 1:44:17. John Fitzgerald was crowned King Sting, completing the full bike race and marathon with a combined time of 8:40:21. Second-place pro division finisher, Jari Kirkland, took home the title of Queen Bee, finishing both events with a combined time of 10:04:09. This entry was posted in Uncategorized and tagged Emerald Mountain, fundraiser, Honey Stinger, marathon, mountain-bike race, Steamboat Stinger. Bookmark the permalink.